EB9 will be the first enterprise bargaining negotiation for some QTU members. So, what is the purpose of an EB and how does it work? Enterprise bargaining is the process of negotiating a new agreement relating to the salaries and working conditions of members. At the beginning of the process, the Union develops a claim in consultation with members. This claim forms the basis of negotiations at the single bargaining unit (SBU), and is also the yardstick against which the progress of negotiations is measured. In 2015, for example, workload, non-contact time and class sizes were identified as key elements of the claim. As a result, the subsequent certified agreement delivered a wide range of measures addressing these issues. Significant gains can be achieved in enterprise bargaining negotiations. That’s why member engagement in the development of the EB claim is vital. Without member input, the key issues affecting members in workplaces may not form part of the negotiations, and they will consequently remain unresolved. 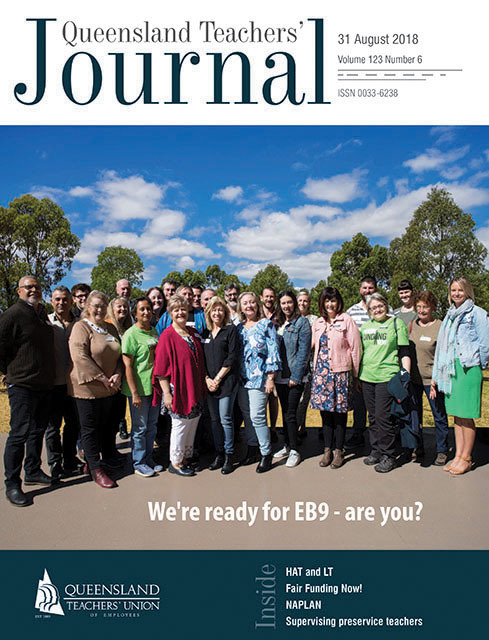 Officers and Organisers will have been discussing EB9 in training, committee meetings, branch meetings and workplace visits during term three. Following feedback from the workplace meetings in term three, the proposal will be to hold branch meetings/area meetings in the initial weeks of term four to affirm the key issues for EB. On 1 July 2018, the experienced senior teacher salary moved to $101,000pa. This is more than double the $50,000 pa that senior teachers (the highest point on the classroom teacher scale at the time) received in 1999 and $8,774 more per annum than that paid to an EST at the start of the agreement. While priority needs to be given to the value of the work of members in promotional positions, the EST salary is currently used as a benchmark when determining the acceptability of any government offer. Key factors that are considered when determining the acceptability or otherwise of salary increases include: interstate comparisons, government wages policy, increases in other education sectors, negotiations regarding conditions, and the timing of increases (e.g. impact of the date of increases on superannuation and other benefits), CPI and other cost of living indices. Interstate salary comparisons – currently the highest paid EST equivalents are $108,003 (Victoria – 1/10/20) and $110,496 (NT – 1/10/20). NT has recently completed its negotiations and ACT, SA and Tasmania are currently in the negotiating process. Government wages policy (GWP) – the current government wages policy is for increases of 2.5 per cent p.a. If this were to remain the same, by 1 July 2021 an EST would be earning $108,766 pa. If GWP was 3 per cent, this would increase to $110,365pa, and if GWP was 4 per cent, this would increase to $113,610pa. The timing of increases – if we lose the 1 July increase date it could significantly impact on the superannuation earnings of members on superannuation defined benefit schemes. Inflation – the inflation rate is currently 2.24 per cent. The predicted inflation rate for 2019 is 2.38 per cent, 2020 – 2.51 per cent and 2.21 – 2.52 per cent.